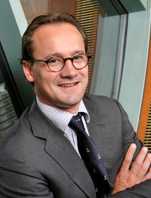 Joep has the responsibility for ABN AMRO's Norwegian branch office in Oslo. He also has the responsibility for the Offshore, Oil & Gas Services and Shipping clients in Scandinavia. Joep joined Fortis in 2000 as started working in the Telecoms and Media finance group after various job rotations within the bank. Before that he worked for three years as a process engineer within Fluor (Daniel) in The Netherlands and the UK. In 2003 Joep joined the shipping desk of Fortis in Rotterdam and has worked there in various roles. Since 2012 he manages the ABN AMRO office in Oslo (26FTE) with a sizable portfolio (US$ 4 bln) and clients (>70) responsible for Scandinavia.